The project, if successful, may be the first step towards large-scale migration of Russian secondary education instutitions and, consequently, of the other state agencies to Free Software as President Medvedev stated last year (Russian) while being the First Deputy Prime Minister. The IBM System Cluster 1350 supercomputer includes 1,344 processor cores in a Linux cluster running at 12.5 teraflops (trillion calculations per second) with 150TB of storage, making it one of the fastest research clusters north of the US border. It’s almost the Fourth of July, and few things represent the freedoms we enjoy as Americans more than open source software. Now, if only the proprietary world would open up their drivers, quit violating the GPL and abandon copy protection, we’d all be a lot happier. everal days ago, Free Software Daily had shared an old video of Torvalds. The video was from 2001. A reader who has watched the computing industry for decades wrote to share his opinion and interpretation of this apparent divide between Linus Torvalds and the Free Software movement. It was highlighted by some. “Thank you for the reference to the Linus Torvalds talk about “the origins of Linux.” It was interesting. I’m not sure that I exactly agree with your characterisation of Torvalds’ view of the GPL. “I do not understand why he says that “the GPL is a horrible document.” He does not elaborate, but if I try to read between the lines, I would say that it is because he is apolitical and he sees the GPL as a political document. He truly is a technical person who is just doing something that he finds to be fun and challenging. He is not doing it for political reasons at all. “I don’t necessarily see this as a reason to distrust him. He does also say that he went for the GPL as a licence because he saw that there is a big problem with the BSD licence in that it allows contributors to make changes and keep them as secrets. He is fundamentally on the same side as Richard Stallman, whether he knows it or not. Perhaps one difference between them is that he didn’t quite have Stallman’s experience with proprietary software which upset him enough to start the GNU project and the FSF. In political terms, one would say that they have an uneasy alliance and it’s in the FSF’s best interest to use Linux for their purposes. It is true that he vehemently dislikes DRM because it is a form of restriction that is never effective. He does, on the other hand, defend Tivoization — moreover saying that he likes it. He recently said in an interview that he was glad to see DRM fading away (at least for music distribution). The introduction/popularisation of Digital ‘Manners’, ‘Trusted’ Computing and other not-so-polite and not-so-trusted technologies might — just might — change his mind. “It’s truly understandable that, being an engineer, he can ignore the problem and let his colleagues deal with this burden.”When Torvalds set up a PC for his wife, and it was quite recently in fact, he chose Fedora. He reported bugs and some people in OS News spotted and elaborated on this. This might tell that he values Free software (somewhere deep inside). Based on interviews, he seems fearful of distraction that comes from ‘politics’ and emotional attachment. Software patents opened up his eyes and some months ago he said he was worried about them. It’s truly understandable that, being an engineer, he can ignore the problem and let his colleagues deal with this burden. It was roughly a week ago that you could also found out what Richard Stallman thinks about Microsoft. Some people have argued that he does not pay enough attention to Microsoft but looks at a broader pictures instead. Despite all of this, ISO continues to deny the obvious. n our last post about the BBC, some visitors argued that we had taken things out of proportion. Some were convinced and some were not. In any event, should one find legitimacy in the new antitrust barrier that has just met by iPlayer? Should it not be an indication that the problem is recognised at a high level? How about all those complaints that reached the European Commission, which in turn promised to handle this along with similar complaints around Europe (not only the UK is affected by such a scam). Project Kangaroo, the commercial on-demand web TV service being developed by BBC Worldwide, ITV and Channel 4, will be investigated by the Competition Commission amid concern that it could stifle rival online efforts. MPs are still not getting it. Instead of embracing the principal of open government and beginning the slow process of re-building their reputation with the public, they want to give themselves more money by stealth. We recently wrote about the use of propaganda terms like “harmonisation” and “digital manners” to pass malicious laws. “The war on terror” is another such example and here are Moody’s comments on that latest developments (cited above). Laws which are apparently being chucked away purely because America wants to disregard them. This is what happens when European government mouth fatuities about the so-called “war on terror”: they then get hoist by their own rhetorical petard. What’s amazing is that probably 90% of Europeans would be against giving this kind of data to the US if they were ever given any way to choose. Which they won’t be, of course: that’s democracy? One more issue that we regularly keep an eye on is the effect of lobbying on Free software. Microsoft is the #1 felon in its area and here comes another suspicion that may or may not affect the reception of Free software in healthcare. Alberto Borges, MD writes in with news that a major Health IT bill is up for approval in Congress and that Cerner spent $180,000 in lobbying the government in the 1st quarter alone. Might the passage of this bill heavily favor the formation of a cartel of proprietary vendors? This has become a recurrent pattern that we highlighted in this Web site before (most recently here). Novell is hopefully getting its money’s SUSE coupons’ worth for all of that sucking up. 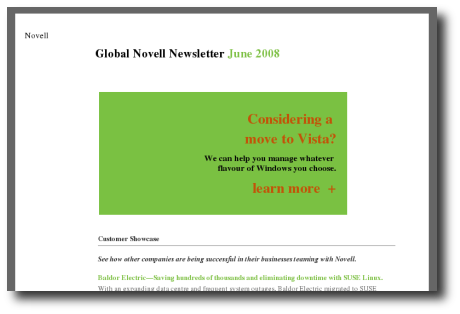 What a way to be greeted as a Novell client. Ironically enough, on the other side of the fence, Microsoft continues its verbal assault against Free/Open Source software. Way to go. That didn’t take long. Nokia announced just last week that it would be open sourcing Symbian, the world’s top mobile operating system by market share, and a few days later Microsoft has started a FUD war against the move. Try competing on the quality of your product. In mobile, Microsoft has always been an also-ran. This will not change until Microsoft stops believing its own FUD and actually invests more heavily in its mobile initiatives, by which I mean in its technology, not in its marketing. Windows Mobile has never been very good, even back in the early days when I competed with them while at Lineo. It’s time for an upgrade, Microsoft. Novell seems kind and gentle towards Microsoft (it has to), but Microsoft continues to hate and combat a wave which it is unable to defeat. It’s a one-way relationship, for sure. ECS representatives said. Both the G-series and J-series come with options for a Linux OS from Linpus Technologies. Last month, Asustek revealed the Eee Box, a mini-desktop PC that has an Atom microprocessor, will come with either a Linux or Windows XP OS, and will begin selling in July for around US$300. The machine takes its name from the popular mini-laptop, Eee PC, by Asustek. As an average PC user looking to buy a Mac, you would most likely be surprised by the high prices. Cognos, which IBM acquired in January for $4.9 billion, is now shipping a version of its IBM Cognos 8 BI software for Linux running on IBM’s System z10 mainframes. The product is delivered as an appliance that is Intel-based, includes a crypto accelerator in hardware (for high-volume event signing) and runs Linux under the hood. For all current fans of Myah OS and all those soon to be, we give you Myah OS 3.0 Dragon. Dragon is the code name for Myah OS built around the KDE 3 desktop. We chose KDE 3.5.9 since it’s still considered the most stable and best supported version of KDE. Scientific Linux release 5.2 i386 and x86_64 has been released. Scientific Linux 5.2 has been released in record time. We want to thank everyone who has contributed, tested, and given us feedback. Without your help this release couldn’t have come out as quickly and smoothly as it has. After a two-week delay, we proudly announce the immediate availability of Parsix GNU/Linux 1.5r0 codename ‘Viola’. Parsix Viola brings several new features, contains a new kernel, updated software packages, updated documentation, improved installer system and several fixes for the reported defects. Finnix is a small, self-contained, bootable Linux CD distribution for system administrators, based on Debian testing. Today marks the release of version 92.0 for the x86/AMD64, PowerPC, and UML/Xen platforms. Ajax toolkits are abundant. There are probably a half dozen leading products plus another half dozen behind that, according to Hakman. They can mix and match features, and all of them are open source, accessible and liberally licensed, he noted. He said the first Philippine Open Source Summit, held in Cebu last week, provided ICT industry players a venue to discuss the agenda that will provide enhanced support for OSS. He said that a number of open source advocates, most of whom became prominent only this year, have also expressed support for the program. “The open source movement is taking the world by storm,” he said. Microsoft certainly never imagined anything like this. A talk given behind closed doors at the Microsoft BlueHat Security Briefing revealed a huge security problem in Internet Explorer. The number of malware detections has grown by almost half a million since the end of the year, jumping from 500,000 total detections to 900,000. “I have a nasty feeling that the situation is getting worse, not better”, says Mikko Hypponen, chief research officer for the security vendor. A MONOLITHIC operating system like Windows perpetuates an obsolete design. We don’t need to load up our machines with bloated layers we won’t use. Tevanian: Does Microsoft have the guts to slim down Windows? Actually, Avie was referring to an atmosphere of desperation, as the Times calls it, just before Apple started the Mac OS X project. Microsoft, possibly, hasn’t hit “rock bottom” yet, and therefore doesn’t feel a need to build something from scratch. Personally, I thought “Windows 7″ was going to be a leaner, less-backward-compatible build, but I was wrong (as I frequently am): “Our approach with Windows 7 is to build off the same core architecture as Windows Vista,” said Bill Veghte, a Microsoft VP. Hello, Windows Me 2.0. Despite what the market may suggest, Yahoo was wise to reject the Microsoft offer. Microsoft’s interest in Yahoo was, for the most part, to acquire its market share in search and online advertising – a segment currently dominated by Google. Microsoft’s acquisition of Yahoo is akin to taking the drumstick, your favorite piece of the chicken, and then throwing out the rest because it’s not really tasty to you. You’re interested only in ensuring that your archrival doesn’t get the drumstick before you do. Professor Chris Johnson, from the computing science department of Glasgow University, said: “There are lots of devices that don’t run Microsoft software these days, and just like that, a lot of devices wouldn’t use digital manners. Loyal XP users are not alone in their exclusion from NBC’s online coverage, the partnership also excludes Mac users, as well those that do their web surfing from a phone. As many people are probably aware, OIN is an interesting-but-not-so-effective solution to the plague which is intellectual monopolies on software. In particular, OIN is unable to defend businesses or programmers who use software programs in the face of patent trolls. That being the case, it was odd to find this new initiative which seems like another OIN, plus a very hefty payment that leaves small businesses and free software developers out in the cold. They endorse rather than battle the problem. A sweeping patent law rewrite backed by seemingly every prominent hardware and software maker was part of that effort, but it stalled in the Senate last month. The so-called Patent Reform Act of 2007 would have curbed the ability of patent holders to obtain what the companies consider disproportionate damage awards, spurring the rise of so-called patent trolls who exist only to extort large payments out of deep-pocketed companies. The giants just seek convenience here, as opposed to a cure. In other news, another struggling company has just decided to sue all the giants from which it hopes to extract money. Struggling in-flight entertainment house e.Digital is challenging some of the world’s biggest gadget companies with claims that it owns vital patents for using removable flash memory in portable devices. It’s targeting brands such as Casio, LG Electronics, Olympus, Samsung and Sanyo in a legal scrap filed last March. But e.Digital says there’s a far larger pool of companies currently infringing its patents, and has “identified annual U.S. revenues of more than $20 billion,” from products using its technology. Pardus surprised me. Today it is listed as nr 49 on Distrowatch, but it deserves a place near or in the top-ten. It is a distro that has everything to become a major newcomer-friendly distro. I must thank Andrew Cullison for introducing me to Ubuntu (“Linux for Human Beings”) last month. One big plus for me was that my old OS (Windows Vista Home Edition) didn’t have networking capabilities. Once I switched to Ubuntu, I could log on to the Princeton network and create my university webpage from my laptop. Very convenient. Ubuntu Hardy gets Sweeter with Sugar! Wow, what a nice surprise! (This has actually been in development since December of last year :o) The OLPC Sugar desktop environment is available in the Ubuntu Hardy repository! You can use the emulator to run it in a window or login as a full blown desktop through GDM (the default login screen for (X)Ubuntu users)! Many people don’t realize the wealth of applications available for Linux — and that includes financial software. Jack Wallen introduces 10 Linux apps that will meet your financial needs, whether you just want a digital replacement for your checkbook or you’re looking for a full-blown accounting package for your organization. Some in the open source community are fighting vendor lock-in by creating superior formats. Now, if only users would adopt them. VivaKi, dude, where is my code? I can remember reporting on a leaked internal memo that Bill Gates issued to Microsoft staff in 1995 which was a literal call to arms to fight both Netscape (not mentioned by name) and the onset of the Internet. It was obvious to Gates that the cards were on the table and the Internet was holding all the Aces. Gates also watched as Microsoft’s last great Wintel project Vista turned into a disappointing flop, with many users and pundits believing that it offered no significant improvements over Windows XP. Similar things could said for Office 2007. Some of my clients are non-profit companies that don’t have a lot of extra funds or could use existing funds in a different way instead of spending it on software licensing. So, how does Mint answer those questions? Extremely well, actually. During the dev panel a few minutes ago, Tom Chilton told us something interesting about playing World of Warcraft on the Linux platform — Blizzard has actually had it working. For “compatibility purposes,” they apparently had an internal build of the game that worked on Linux. Ladies and gentleman, Windows XP is dead. Say goodbye to annoying pop up balloons, and say hello to Ubuntu! Sure, I am sad about the departure of Windows XP, but this just gives me more reason to transition to Linux. One of the first things to notice about Ubuntu 8.10 Alpha 1 is its new theme. Originally, Ubuntu 8.04 was supposed to introduce a (much-anticipated) new default theme for Ubuntu, but that was pushed back into Intrepid Ibex. Ubuntu MID is finger friendly, with no stylus needed. You drive Ubuntu MID with touch. Simply tap the screen or drag a finger to make gestures for intuitive navigation and control. All you will need is to tap an application with your finger to launch it, and tap menus and buttons to use them or swipe a Web page to pan up, down or sideways. Playing on a mobile device was never that much fun as here you can also swipe a video, photo, song or thumbnail page to move to the next or the previous one. Grou.ps has also announced that it is open sourcing a restricted version of its code under the Affero Public License. Do Smartphone Viruses Threaten Networks?